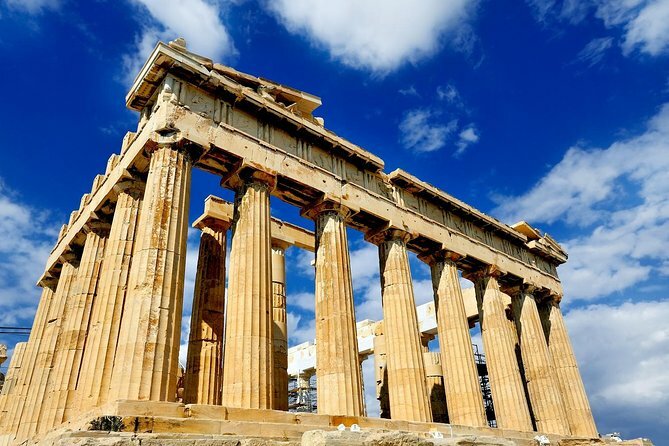 Admire the wonders of Ancient Greece on this comprehensive 3.5-hour city tour of Athens. Discover the historical center of the city as you drive past such attractions as Hadrian’s Arch and Syntagma Square. See the first modern Olympic stadium, then head for the main attraction: the UNESCO World Heritage-listed Acropolis. Board the vehicle and begin with a panoramic drive around Syntagma Square, passing by the National Garden, Hadrian’s Arch, St. Paul’s Church, Parliament, Tomb of the Unknown Soldier, Catholic Cathedral, and Schliemann’s House. Continue past the Athens Trilogy, which includes the University of Athens, the Academy of Athens, and the National Library as your guide introduces you to the ancient and modern history of Athens. Next, it's time for a photo stop at the white marble Panathinaiko Stadium where the first modern Olympic Games took place in 1896, before passing by Zappeion and the Temple of Olympian Zeus. Make your way to the iconic Acropolis, one of the world's most recognized ancient sites. Visit Propylaea, the Acropolis' monumental entrance which blends Doric and Ionic building principles, and the small Temple of Athena Nike, which stands on a protruding mass of rock, protecting the gate to the ancient citadel. Admire the ruined temples of the Parthenon and Erechtheion before concluding your tour with a drop-off back at the original departure point. We suggest you to wear light clothes, hat, glasses and shoes that are not slippery. The tour is not suitable for people with hurt or mobility problems.